Gerald G. Griffin’s stunning new novel reflects fiction based on fact. Meet Bob Daniels, who against all odds and misfortune in his life becomes a noted psychologist. He’s likable, highly intelligent, cunning, and he possesses an unusual sense of humor. His father, a troubled war veteran, fearfully warns Bob of his perilous fate, attributing it to a prophesy about madness that took place during wartime. In unlikely fashion, Bob meets Gloria Hopkins, a noted stage performer who shows a zest for life. They fall deeply in love, but it’s thwarted by an inexplicable force of madness. The two are pulled into a harrowing journey in which they face impossible odds and circumstances guided by the unknown. 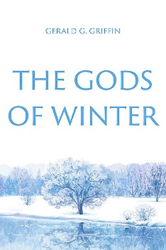 The Gods of Winter contains humor, sadness, strife, and tragedy, all making for an unexpected ending. About the Author: Gerald G. Griffin grew up in Flint, Michigan, and is a Ph.D. graduate of Michigan State University. He now lives in Gainesville, Georgia. His previous novels are "The Corruptors," "The Death Disciple," "The Last Coming," and "Of Good and Evil." “This harrowing story will shake you to your core … and keep you reading to the very last page. We are thrilled to announce its release,” said Robert Fletcher, CEO of Strategic Book Publishing and Rights Agency. http://sbprabooks.com/GeraldGGriffin or at Amazon.com or Barnesandnoble.com.